He's Baaaacccck . 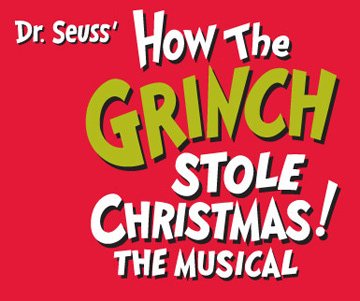 . .
"Dr. Seuss' How The Grinch Stole Christmas: The Musical"
"Dr. Seuss’ How The Grinch Stole Christmas! The Musical" returns to Boston to play the Citi Performing Arts Center Wang Theatre for a limited holiday engagement, Friday, November 23 - Sunday, December 9. Audiences will have the opportunity to re-discover the magic of Dr. Seuss' time-honored holiday story as it comes to life on stage. Max the Dog narrates the tale as the mean and scheming Grinch, whose heart is "two sizes too small,” plans to steal Christmas from all the holiday-spirited Whos down in Whoville. The Grinch, however, ultimately realizes there's more to Christmas than ribbons and boxes and tags. The stage production features a full score, including"You're A Mean One, Mr. Grinch" and "Welcome Christmas" from the original animated television special. While the story was first published in 1957, The Grinch made his TV debut -- featuring the voice of Boris Karloff -- during the 1966 holiday season. The Grinch was basically a black and white drawing in the original book -- he became green for TV. As an added bit of trivia, Thurl Ravenscroft, who sang "You're A Mean One . . . " was also the voice of Frosted Flakes' Tony The Tiger. Embraced by generation after generation, "Dr. Seuss' How The Grinch Stole Christmas! The Musical" features sets and costumes inspired by Dr. Seuss’ original illustrations, helping to transport audiences to the whimsical world of Whoville, while the new music and book by Mel Marvin and Timothy Mason breathe added life into the timeless narrative. For tickets and information, stop by the Wang box office at 270 Tremont Street, call 866-348-9738 or visit www.citicenter.org.